In the ceramics industry, as well as in any context where large quantities of dust or powders are present, such as the field of bagging machinery, the vacuum cups employed can take in large quantities of dust less than one micron in size. In cases like these, traditional suction filters would require the use of cartridges with high filtration ratings, thus reducing the vacuum pump’s suction capacity. It is precisely for this purpose that developed our high-autonomy oil bath suction filters FO 160 and FO 300: for filtering out even the finest impalpable dusts without decreasing the pump’s performance. 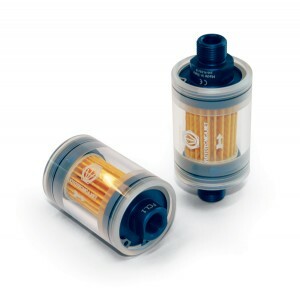 These exclusive Vuototecnica filters ensure greater maintenance autonomy for the vacuum sources connected to them, and can even be used to eliminate the vapours and volatile substances that could otherwise easily contaminate the lubricating oil in lubricated vacuum pumps (MV or VTL series). 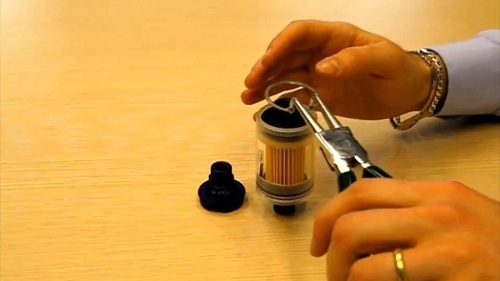 These filters can be used with any type of oil, even used oil, provided that it still retains a minimum viscosity level. The internal filter elements can be easily removed and washed, and the entire operation can be carried out quickly thanks to the release clamps that hold the structure in place. Their ease of use is also guaranteed by the presence of two visual indicators, which allow the operator to check the filter’s oil level and clog status. In order to block the impurities and dust produced during the packaging of bulk products, even the finest particles, Vuototecnica offers FCL in line suction filters with paper cartridges. 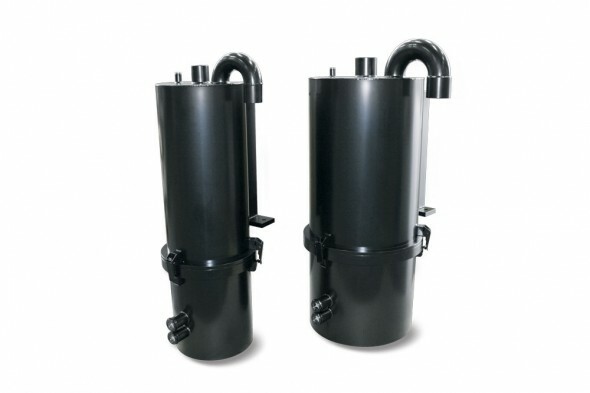 These filters offer a wide range of advantages, including a compact size, visual inspection facilitated by a transparent Plexiglas body, interchangeable threaded connection flanges in anodized aluminium, and the maintenance of flow capacity even with the partial obstruction of the filter cartridge itself. FCL filters are unlike any other filter currently available on the market. 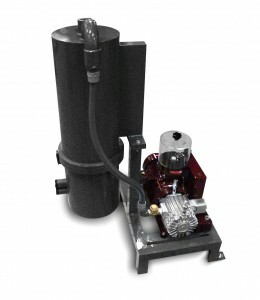 In fact, they’re designed specifically for handling vacuum operations and, thanks to their internal geometry, are even capable of ensuring a much greater cross-section and suction flow than any other in-line filter. The complete visibility afforded by the Plexiglas allows for the cartridge’s clogging status to be assessed instantaneously. And even more importantly, these filters can be fully inspected. In fact, they can be opened at any time and the paper cartridge can be easily cleaned using compressed air. These products offer clear advantages when compared to the single-use disposable filters normally used with packaging machinery. Even in terms of reduced maintenance time. With FCL filters, you’ll always have everything under control. Based on the user’s specific requirements, these filters can be installed directly upon the vacuum piping near vacuum cups, vacuum clamping systems and various other utilities. The end user can even realize ad hoc configurations thanks to the various types of threading available for the aluminium cylinder heads. Suctioning thick and creamy substances and coolants can be difficult and risky using traditional rotating vane vacuum pumps. 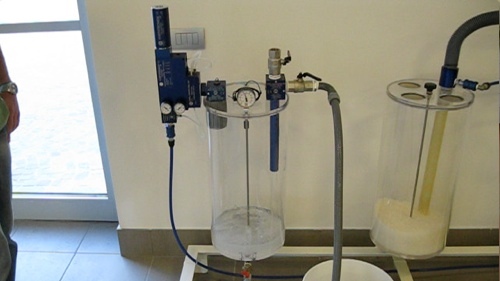 In order to satisfy this market demand, Vuototecnica has developed special suction units with siphon filters (GA FS) for suctioning water and liquid mixtures and fluids saturated with condensates. 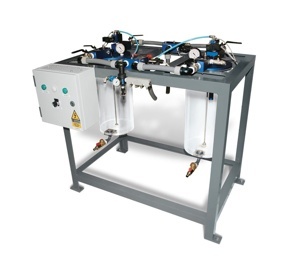 These exceptional suction units combine the use of siphon filters with multi-stage venturi effect vacuum generators, and are therefore capable of retaining fluids and solid impurities while at the same time suctioning fluids saturated with steam or liquid condensates. All this while ensuring maximum energy savings without compromising on performance. Vuototecnica’s suction units are available in different sizes and can be furnished with on board vacuum generators with various suction rates. They are exclusively powered by compressed air (4-6 bar) and can be used for any application in which the use of electrically powered vacuum sources is prohibited or impossible. The vacuum level inside the Plexiglas container is automatically maintained by the pneumatic vacuum switch art. 12 02 30 (which can be integrated with the vacuum generator, based on the model). This vacuum switch controls the compressed air intake valve, which in turn controls the vacuum generator's intake based on the minimum vacuum level set on the vacuum switch itself. Vuototecnica's suction units are therefore perfect for vacuum cup clamping systems used for gripping uniform surfaces, such as glass, granite, marble and light alloys, as well as any applications in which significant amounts of coolant liquids are present.